Sandy Island – New Caldonia? We are going to start you off with a great disappointment, like I am to my parents. 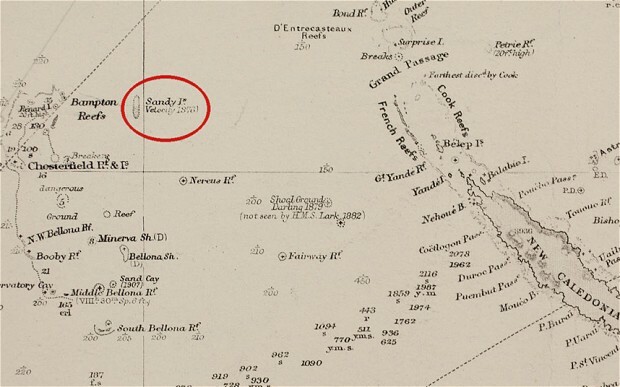 Over 1000 kilometers off the east coast of Australia at 19* 12” 44” S; 159* 56’ 21” E here lies Sandy Island…or does it? Thus should read the “obituary” published be Maria Seton. She became rather suspicious of this creepy island which was first reported by the whaling ship, Velocity, in 1876 and has been showing up on maps ever since, until she killed it. There is maybe even more to be said for discovering something that does not exist at all. The island has appeared on British and US military maps for ages with no confirmation. While we set off to challenge GoogleEarth, let’s start with this gem. Behold the image they created of Sandy Island where they drew innocuous black scribble over the water and labeled it Sandy Island. This tipped Maria off. She wasn’t having it. Like a petulant child with a middle finger to the satellites, she took a boat out to the coordinates. Low and behold there is nothing but open ocean (since copy/pasted by GoogleEarth over said black blob). Not only is there no island, but the depth reaches about a mile. There is no trace of an island ever existing. Let’s take a second. A deep breath. A moment of silence for Sandy Island. Now hear this. Did you know that “Utopia” was coined by Thomas More and means “no place” or “no where?” Maybe this is what all of us are looking for; the real lost place. The trick is that you can’t find it. Remote? Yes. Lost? Maybe. There is plenty more to be found in this series, but we warned you about this first one. Here is an explanation, though. It is possible that what Velocity wandered upon was a pumice float, which could have been created by something like this lava bubble that blew up the internet last week. A similar one haunted us around 2012. Rest in peace, Sandy Island, like my imaginary friend when I was a tyke. The seasteaders have been think-tanking for a long time now, but can’t seem to get out of their heads and make their floating cities a reality. When you consider that 71% of the earth is covered in water, we may as well learn to inhabit it. Enter, The World. These people take getting away to the next level. The world is a city, but also a ship. Those living aboard own their homes within this city ship and also hold stake in the ship itself. It’s like a condo association, but without the condo. At board meetings they decide their route for the year, coin tossing over the Caribbean. The World has been cruising non-stop since it launched in 2002. There is a market and deli, a gym apparently offering Zumba classes and the website boasts 6 restaurants and the only tennis court on the water. Those not trying to sell you a multi-million dollar home on the water will admit that only 2 of those restaurants are actually functional and the tennis court is a poorly maintained pond. If you have the money and the disdain for being land-locked, you can purchase your place aboard The World, one of the tiniest cities, but the largest residential ship (are there others?) on Earth. With 165 “homes” you better learn to love your neighbors, because this may be the smallest of small towns with real big ideas.